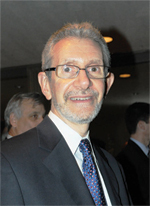 JCRC�s Executive Vice President, Michael Miller. With over 60 Jewish organizations under its umbrella, the Jewish Community Relations Council-New York (JCRC) exhibits great influence and implementation of the Jewish consensus on key issues. And while Jews make-up a tiny proportion of the world's population, the Big-Apple boasts of a big Jewish population. So the JCRC sure has its work cut out for it. Question: How does the JCRC juggle its many divisions and subdivisions and maintain as well as grow its out-reach and goodwill efforts? Answer: through dedication to bettering the Jewish community and raising awareness of problems and bridging the gap and easing the tension within and among communities --and of course its personable, passionate touch. Most of the people who work here have never left, said Executive VP Michael Miller, who added that these lifetime employees are very qualified and could be making big-bucks elsewhere but chose to stay. Since its inception in 1976, the organization has been a tireless advocate for Jews. Efforts at coordination and cooperation have proved successful due to the diverse staff tasked with everything ranging from Community Outreach to Government Relations. There is even a director whose title reads "Task Force on Missionaries and Cults." The sheer number of responsibilities are overwhelming to say the least. There are three main divisions: Government Relations, Intergroup Relations, and Jewish Communal Affairs. The former oversees Jewish voters, policy-makers, protecting Jews from deemed threats, and ensuring crisis coordination. Intergroup Relations appeals more to youth and organizes fun activities to engage and prepare them to become future leaders. The last major vein, Jewish Communal Affairs, brings together the collective Jewish organizations, both big and small, and works with five programs: one for Hillels, one for spirituality, one for Jewish culture and history, one for free legal services, and one for religious and fringe group threats to Jews. Among the many events the organization has actively participated in include, most recently, a rally to oppose Iran's repressive regime lead by President Ahmadinejad speaking at the United Nations General Assembly. Although Mr. Ahmadinejad was allowed to deliver his controversial speech on the podium, the well-attended rally was successful in its message of solidarity of Jews and gentiles to promote equality and human rights for all and oppose anyone who would deny those fundamental rights. It is important for the Jewish people, and the State of Israel, to have an active organization, such as the JCRC, with its outreach to multi ethnic, multi national and cross cultural organizations that is so vibrant and so vital in defining the issues that matter to us all, directing the appropriate actions that must be taken so that voices of reason and voices of truth and morality can be heard. For more information on fundraising efforts and to see how you can get involved with the JCRC, feel free to visit their user-friendly website at www.jcrcny.org or call 212-983-4800.